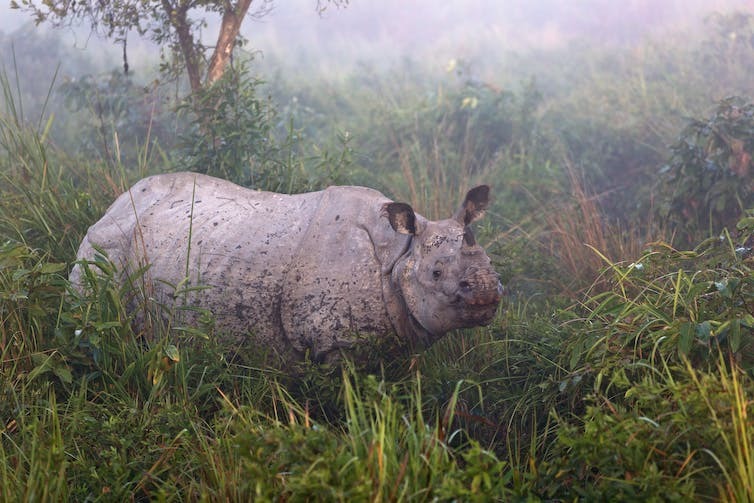 The link below is to an article that indicates good news from India, with Rhino numbers rising. The global gold standard used to assess the extinction risk of any species is the International Union for the Conservation of Nature (IUCN) Red List of Threatened Species. The Red List’s assessment criteria are based on the so-called “50/500 rule”. This states that to avoid inbreeding depression (the loss of “fitness” due to genetic problems), an effective population size of at least 50 individuals in a population is required. To avoid eroding evolutionary potential (the ability of a population to evolve to cope with future environmental changes), an effective population of at least 500 is required. The key here is that little qualifier “effective”. This refers to individuals who can breed with each other without causing inbreeding or loss of genetic diversity. A family unit, for example, might have only one or two reproductively effective members. But they would also need another, unrelated, family unit nearby for their offspring to reproduce with. That means that the number of effective individuals is lower than the total population. On average, the ratio is about 0.1 to 0.2; that is, one effective individual (genetically speaking) for every five to ten members of the population. This also assumes that the breeding pairs are matching up based on an optimal genetic basis – what geneticists call an “idealised population”. In a perfect world, a breeding pair of animals would be completely unrelated and would have no chance of producing babies with any genetic defects caused by inbreeding. However, real populations rarely behave like this, so some pairs have a certain amount of relatedness. As the population gets smaller, the chance of breeding with a relative increases, which leads to more frequent and severe inbreeding. So let’s do the maths. Fifty effective individuals – the ICUN standard for avoiding inbreeding – equals a total population of 250 to 500. This means that, in a hypothetical apocalypse, humanity would need a lot more than a handful of survivors to repopulate effectively. However, to retain evolutionary potential – to remain genetically flexible and diverse – the IUCN criteria suggest we would need at least 500 effective individuals. That requires a population of 2,500 to 5,000. Some preliminary results emerging from ongoing research at the Centre of Excellence for Australian Biodiversity and Heritage appear to confirm this. Using both ancient DNA techniques and palaeo-demographic models, we have estimates of a minimum effective population size for Aboriginal Australians when they first appeared of about 250. This means at least several thousand had to arrive around the same time to manage to colonise the entire continent successfully. Of course, not every species has the same ratio of effective to total population size, and not all populations necessarily need 5,000 individuals to survive. But without being able to measure the true ratio for a specific population, it helps to default to the average situation. The idea that 50 individuals is enough to avoid inbreeding depression comes largely from laboratory populations that probably do not describe the situation for populations living in wild environments. In species as varied as houseflies and pinkfairies, populations substantially greater than 50 individuals still succumb to inbreeding depression. So, in many cases, 50 effective individuals is in fact too low to ensure no inbreeding depression occurs. It may be that 100 effective individuals is closer to the true minimum, without even considering how populations respond to evolutionary challenges. So, sensational analogies about the apocalypse aside, do human beings follow the same rule? We aren’t entirely sure, but evidence suggests that most species in vastly different groups roughly follow the same trend. An emerging rule of thumb is that when a population starts to dip below several thousand individuals, it has a high likelihood of going extinct. Some people believe rhino horns can cure several ailments; others see horns as status symbols. Given horns are made of keratin, this is really about as effective as chewing your finger nails. Nonetheless, a massive increase in poaching over the past decade has led to rapid declines in some rhino species, and solutions are urgently needed. Rhinos inhabit places occupied by other less high profile threatened species – like African wild dogs and pangolins – which do not benefit from the same level of conservation funding. 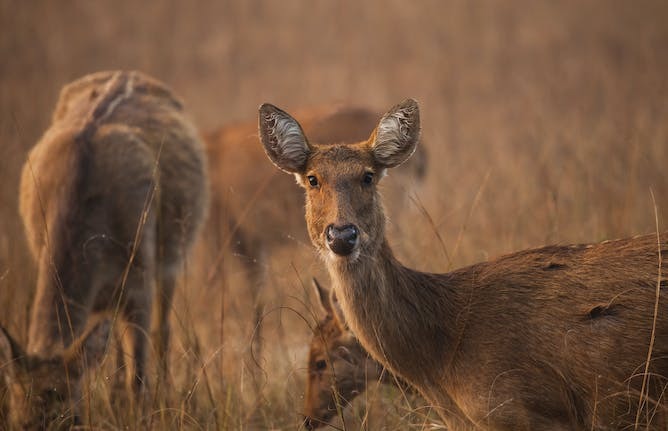 Conserving wildlife in their natural habitat has many benefits for the creatures and plants they coexist with. Rhinos are keystone species, creating grazing lawns that provide habitats for other species and ultimately affect fire regimes (fire frequency and burn patterns). They are also habitats themselves for a range of species-specific parasites. Abandoning efforts to conserve rhinos in their environment means these ecosystem services will no longer be provided. Kaziranga is also home to tigers, elephants, buffalo and these swamp deer.